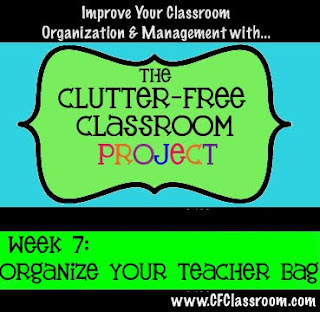 I have been severely slacking on the Clutter-Free Classroom Project..... but here I am today to talk about my teacher bag! Sorry about the sun there... it was just pouring in!! I have a 31 bag! It's the organizing utility tote. I got it for Christmas from one of my students and I love it a lot. It has held up so far and I think it is suuuuuuuper cute. This is one area that I don't need help with as far as decluttering!! That is because I never take ANYTHING home. I know for a fact that I will not do it so I have just accepted it and moved on with my life. Here's a little peek inside! All I have, from top to bottom, is my planning book, two library books to be returned, my little laptop and the cord. I never have anything else in here so it stays super clean and decluttered! And here is one area of my room that is always decluttered! These are the little baskets where I keep all of our reading stuff. My manuals are on the top there. I keep all of my other manuals in a plastic crate inside the coatroom, but since these aren't bound, they don't sit nicely like the other ones. Plus I can never find find them if I don't keep them in the baskets! So you can see the manuals on the top, and then underneath there are workbooks and readers for each kid. I also keep the CDs in there because I would lose those too. :) I am happy that I thought to keep the books like this... at the beginning of the year they were across the room and it would take the kids two hundred years to get their books and come to the carpet. Now it's right next to us so they just come over and grab their stuff! And the kids LOVE to reorganize this area after reading is over because no one ever puts their books in like this when they're done. Okay, that's all for today! Now I am off to a fondue party!! I have never had fondue so I am hoping for the best!! Fondue is great! We have a place here called the Melting Pot it is one of my favorite date night locations. I love love love fondue!!! YUM! And I love when my kids organize for me, too! Love the bag! Your print is so much cuter than mine! I definitely want to re-order now. :) I can never have too many teacher bags! Just purchased myself 2 Thirty One bags - I try not to take too much home, but some weeks are better than others. I, too, have slacked on the project, and I was so glad I got on today to see all the teacher bags!! Love that you don't take anything home. I have the same bag and suped it up recently for the bag declutter.